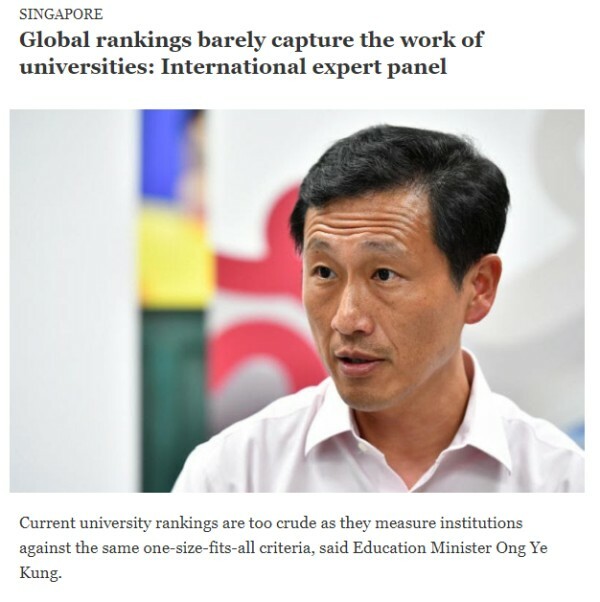 I agree with Ong Ye Kung but how to maintain a first rate reputation for our universities with scant regard for how they rank is not easy to pull off. I look forward to him taking the same attitude toward the various KPIs our government bodies are run. Never let the rankings or KPIs be the real boss unless they serve us very well. Even if they could start off on the right footing, mission drift is unavoidable given enough time. Good that this guy dares to change and is also modest enough to check help his predecessor achieved unmet goals. Most times we have the new boss more eager to make his own mark and no humility to continue the work of his predecessor when that is better for the people. China is subjecting everyone and even American businesses to this "test of sincerity". That Taiwan is a part of China, show it in your company literature. This reminds me of the old story when the religious leaders asked Jesus if they should pay taxes to Caesar? It was a trap just like China has set up for all of us as well. Jesus asked for a coin and then said, "Whose face is on the coin?" Afterwards he suggested you pay to each its due. We can do the same here. No maps are shown until you identify yourself. If you are Chinese nationals we will show you what you want to see. If you aren't, we won't provoke the Taiwanese with what the PRC want either. Another version of this take which is more up to date is "see people talk people, see devil talk devil"
So what decoding China's demands? Yep, this is not new and shouldn't be news but it is only because it surfaces, got no traction and then disappears until the next time it pops up. 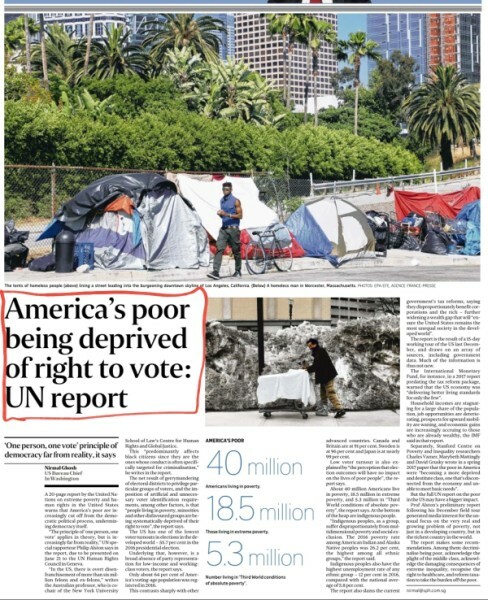 America ought to be ashamed of this. It takes away any fragment of moral authority they have left to go around the world telling others how they should run their country. Physician heal thyself! McDonald's here knew how to have fun. 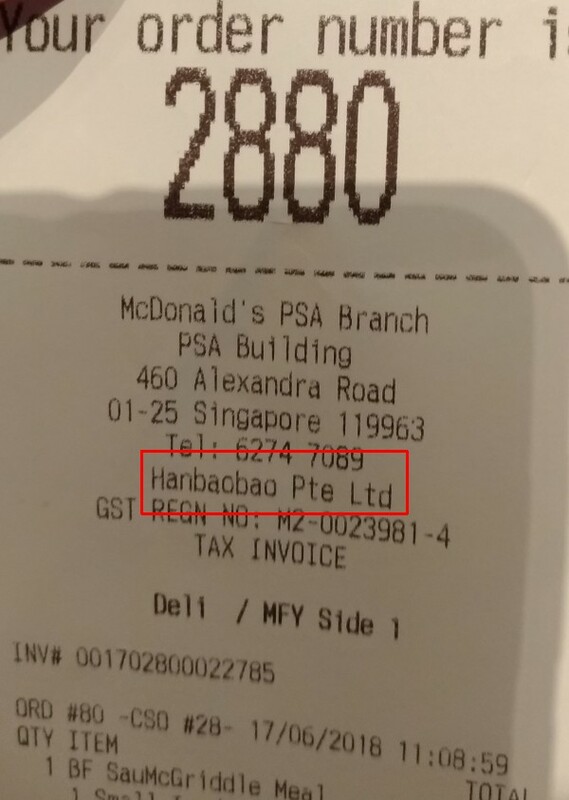 Its business is registered as "Hanbaobao Pte Ltd". I have never noticed this but it caught the eye of the daughter this morning. Tom Plate calls Singapore "Smart Power". As a foreign writer he is unconstrained and may be where he comes from they are used to being more imaginative. Here we watch over our shoulders too much. PM Lee has always been a good student of his late father's ideas and it comes sparkling through in this conversation with Tom Plate. What we do not know and may never is if he is able to when to adapt or reject old ideas when things change permanently. That is when the why of whys of previous ideas change. PM Lee and his team are first class for understanding our problems but what is lacking are bold and imaginative solutions. I think from the late LKY perspective many of our problems are intractable if we cannot up our birth rates and it is clear we have not. Now I am not discussing this topic here, another time perhaps. What I waited and did not get the satisfaction of reading is for PM Lee to say to the US and China is simply this: Keep trying to get along but also always commit to peaceful solutions. Make use of the time to understand each other better. In the past America's overwhelming superiority was a buffer to play nice and generous with China. Now that is gone the US feel insecure. Security blanket must be replaced with knowing China better. The Chinese must understand there may not be a peaceful rise for them but a huge waste of resources from overcoming obstacles the Americans will put in front of them if they do not do more to help American feel less threatened. China has to understand more haste means less speed and in this instance great danger as well. Domestically both sides must do something to rein in their hawks. There is not future in conflict. It is a totally bankrupt path. An impossible Indian Christian AG for Malaysia? What an intriguing development next door! 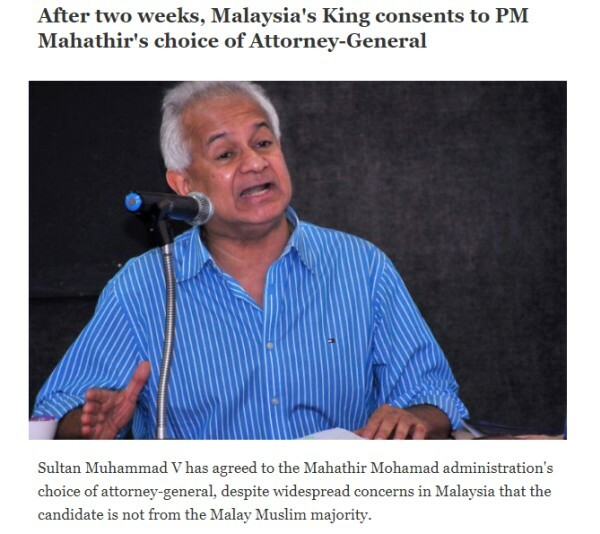 Mahathir and PH want to appoint a non-Muslim at the next AG for Malaysia? Coming from an old fox there is certainly more to this than meets the eye. No harm taking him at face value for now but I would be most surprised if in the end it isn't a Muslim (not necessarily Malay) that is appointed as AG. I have not the time to work this out. Even if I do, I am not confident I can figure this out. In the first place there is so much about Malaysia I don't know. My primary concern is if our leaders up to dealing with Mahathir. Mahathir gets his way simply because the Constitution is on his side and as PM he has the initiative as the executive power. This is a multi-step play. Time will likely show that this story will not end normally like you would expect in most other countries. Keep watching. This morning I remarked that they forgot to ask the children. Later when I was reading that on my PC, my daughter remarked that they were never asked their opinion and quickly offered that when they were in school her classmates were unhappy and wanted to leave Singapore if possible. Well only one had left and the rest are still here. 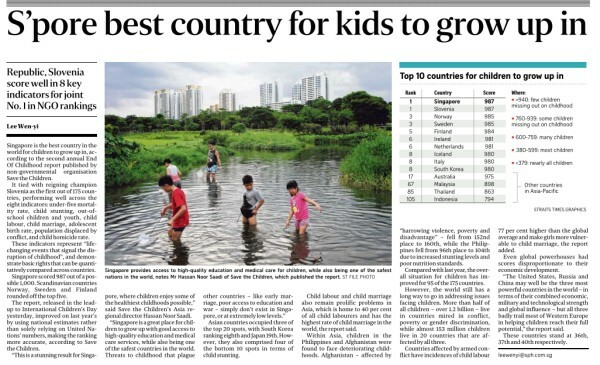 Singapore is indeed an excellent place for kids to grow in the same sense Churchill observed that democracy is the worst form of government saved all else. In this sense there is much room for improvement in the best country to bring up kids. Sharing pole position with us I suspect Slovenia kids are much happier and moe satisfied than ours.